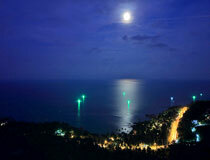 This new, luxurious Villa is located on a hill above Chaweng Noi in the East of the island of Koh Samui, offering a fantastic view far out onto the sea and on the beach and consists of two identical semi-detached houses. The interior is first class and leaves nothing to be desired. The driveway inside the development is steep and has a lot of curves and therefore is not suitable for unexperienced drivers. To the beach it is just a 5 minute drive. 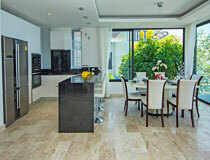 You enter the house through a door next to the car park and come into a spacious open plan living-dining-kitchen area. The living area is furnished with a big, comfortable sofa made of Italian leather, and provides a table and a sideboard with a big Sat-TV. An air conditioning and a ceiling fan make sure that it is nice and cool in this area. 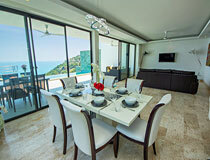 The dining area with a table and six chairs adjoin the living area. 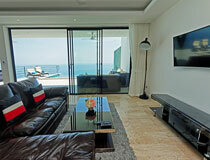 Through sliding glass doors you have a stunning view far out onto the sea. The open kitchen has a counter made of African granite and three bar stools. The equipment of the kitchen is more than complete and leaves nothing to desire. Big windows allow light and air to flow into the room and through sliding glass doors which stretch along the whole length of the room you have access to the pool deck. Here you find the 8x4 meter infinity pool with a waterfall and a dining table with six chairs. The pool deck is partly roofed and from the sofa with a table and two armchairs or from the two sunbeds you can enjoy the fantastic view out onto the sea and the beach while you sip on a cool drink. Next to the entrance is a separate bathroom with wash basin, shower, and toilet and the stair which leads up to the upper floor. 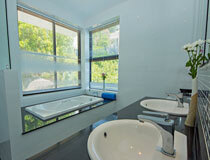 There are all three bedrooms which all have an en suite bathroom with wash basin, shower and toilet. (master bedroom with bath tub) All bedrooms have a double bed, a wardrobe, air conditioning and a TV with excellent WiFi reception. The two bedrooms to the front have access to a big balcony which stretches along the whole length of the house and the bedroom to the rear of the house has garden view. Four wheel drive vehicle absolutely necessary because the drive way is steep and has a lot of narrow curves. Not suitable for unexperienced drivers. A refundable security depost of 500 US$ has to be paid at check in. Sorry, but no big pets allowed. Only small breeds like Chiwawa or similar small dogs are tolerated and the refundable deposit for damages will in this case be increased to 1.000,-USD! For inquiries, please contact: wolfgang@samuihouserentals.com or use our contact form. 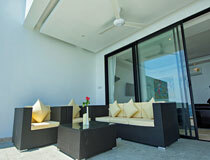 Please name the house for Koh Samui holiday lettings, Chaweng Noi Villa, you are asking for, Thank You.